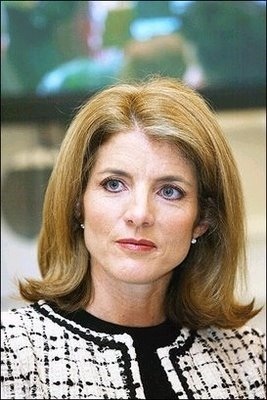 Caroline Kennedy (1957- ) is the daughter of President John F. Kennedy and Jackie Kennedy Onassis. When her brother John died in a plane crash in 1999, she became their only living child, the last child of Camelot. Senator Ted Kennedy is her uncle, Maria Shriver is her cousin. In January 2008 she came out in support of Barack Obama, saying that he would be a president like her father. She became part of the committee to choose a vice president for Obama. She said that Joe Biden was by far the best choice. Obama has faith in her wisdom. Up until then she led a largely private life, avoiding the public eye, bringing up her three children. But now with her mother and brother gone and her children almost grown – the youngest is 15 – some say she is entering a new stage in her life. She does have that Kennedy thing of wanting to make the world a better place and a deep respect for civic courage. There was even talk that maybe Obama should choose her as a vice president. She certainly has the name but not the experience. She could certainly become a senator if she wanted to and so maybe even president in time. In 2004 she did campaign for John Kerry but she did not come out in support for him till after the party convention. She was a Hillary Clinton supporter, giving her money in 2006 and 2007, but by September 2007 she was giving money to Obama instead. It was her children who got her to take a serious look at Obama. 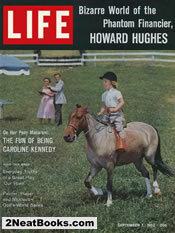 Neil Diamond came up with the song “Sweet Caroline” (1969) after seeing a picture of Caroline on her pony, Macaroni, which she brought to the White House. Her father was shot dead five days before her sixth birthday. A year later her mother moved the family to New York where she grew up at 1040 Fifth Avenue, just a block from the Metropolitan Museum of Art – where she would one day work and meet her future husband. She studied at Harvard and got her law degree at Columbia. Both explain the law to the general public. She has also edited some books, something her mother used to do when she was growing up. She is the head of the Kennedy Library in Boston and takes part in the NAACP Legal Defense and Educational Fund. She helped to raise $350 million for public schools in New York. She owns the Red Gate Farm on Martha’s Vineyard, something she got from her mother. She has lived most of her life in New York and still does, on Park Avenue. WHO wrote this crap? This reads like it was written by a 4th grader. I am the fourth-grader in question. What in particular is wrong with it? That would be more helpful than just calling it “crap”. I give you credit abagond, for allowing rude comments to remain. I wouldn’t. Thanks for all the great information and especially for the photos of 1040 Fifth Avenue!